I use the same green sand mixture for mold blowing as I do for sand casting. I make a pattern in the sand and then gather a large amount of glass on the blow pipe. After the final gather, I go straight to the mold and blow the bubble into the pattern. 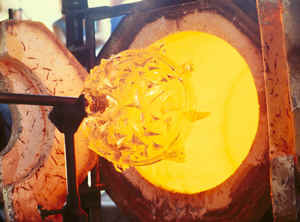 The dripping hot glass of the last gather takes the detail of the mold with remarkable precision. 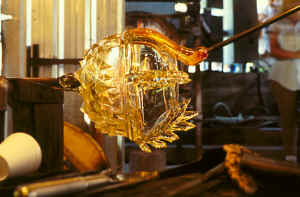 The glass stays in the mold for several minutes to cool and solidify, while we torch what will become the smooth top of the vessel. 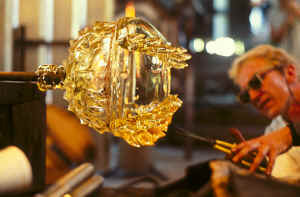 Once the vessel is transferred to the punty and the lip is finished, we apply the hot bits that get cut into the flames. 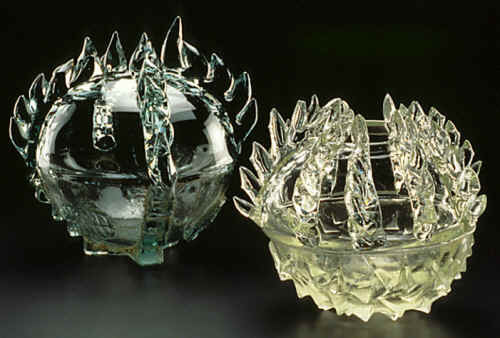 The final piece will have a rough and textured underside and a clear top with colored or clear flames (example). On some of the pieces we crack part of this top off and apply the flames on the inside of the vessel (example).